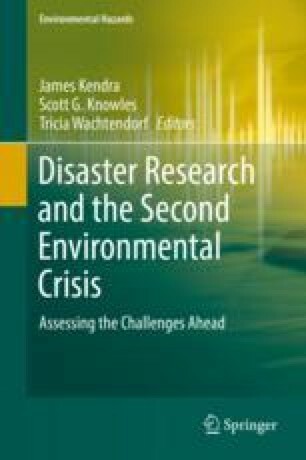 The opening chapter in this volume portrayed the growing urgency of disaster research, as the nature and scope of hazards shift. People already familiar with their local environment may find that a changing climate changes their risk for certain kinds of hazards (Relf, G., Kendra, J. M., Schwartz, R. M., Leathers, D. J., & Levia, D. F. (2015). Slushflows: Science and planning considerations for an expanding hazard. Natural Hazards, 78(1), 333–354). People moving from place to place in search of better jobs or housing may move into a hazard milieu that is new to them. Political transformations with an authoritarian bent will probably increase vulnerability amongst populations already at greater risk for experiencing a disaster and for recovering more slowly, such as those in poor housing, those with chronic illnesses, and those with Functional and Access Needs. Robust research is needed, but some critics have emerged to challenge the practice and propriety of disaster research, especially quick-response research. This chapter argues for an affirmative right to conduct research. The “Workshop on Deploying Post-Disaster Quick-Response Reconnaissance Teams: Methods, Strategies, and Needs” was supported by a grant from the U.S. National Science Foundation. Rochelle Brittingham, Lauren Clay, and Kimberly Gill assisted in the organization and implementation of the workshop. The views presented in this chapter are solely those of the authors.